Grant County Veterans Service Officer Bob Kelley (right) works with World War II Army veteran Frederick Kern at the Grant County Government Building in Marion, Ind., on Monday. NPR — along with seven public radio stations around the country — is chronicling the lives of America's troops where they live. We're calling the project "Back at Base." This story is Part 2 of a three-part series about veteran benefits (Part 1 / Part 3). The latest data from the U.S. Department of Veterans Affairs show Indiana — which has the 35th highest number of veterans in the U.S. — receives $4,935 per veteran each year. If they received as much as Utah — which has the 35th highest return — Indiana vets would receive on average another $558. And if they received the national average of $6,088, that's another $1,153. Retired Brig. Gen. Jim Bauerele has spent years working to match veterans with their benefits. "I think Indiana has neglected veterans," he says. "I think veterans are uneducated as to what their benefits are, and there has been little effort undertaken to communicate and get that to veterans." There are all sorts of reasons why veterans in one area may not receive as many benefits as veterans in another. Veterans from different eras, such as Vietnam or Iraq, can receive different amounts. Older vets might receive more benefits. VA applications are also notoriously difficult to complete. Vets don't always get the help and guidance they need. Bauerele says one reason for the poor showing in Indiana can be traced to what are called veterans service officers (VSOs). County-level VSOs are part of a system operating in 28 states, and they're supposed to help vets get the benefits they've earned. 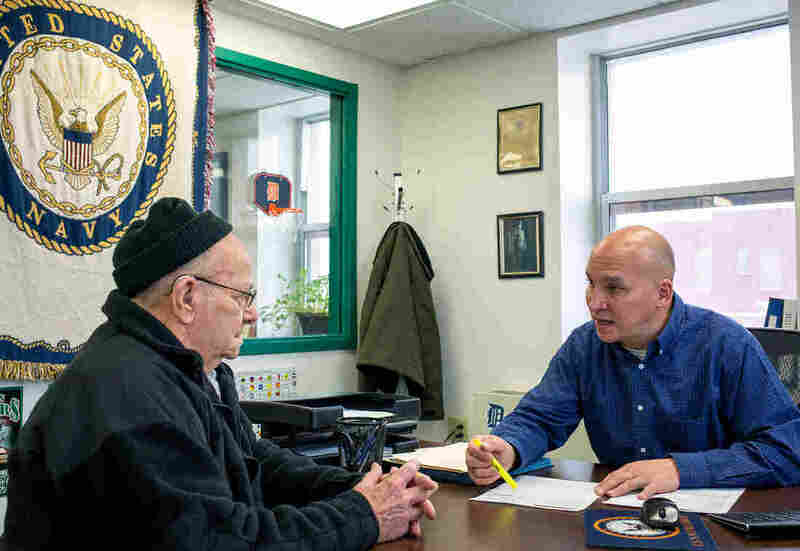 Some VSOs operate on the state level, and veterans groups like the American Legion and Veterans of Foreign Wars have their own VSOs, which operate in most states. Some county-level VSOs in Indiana operate on a shoestring. "Some counties have an officer who is part-time, works three days a week, part-time and doesn't even have an office or a computer," Bauerele says. So depending on where they live, one vet might find an office with a full-time staff trained to file paperwork with the VA, while another might find a closed office, or a VSO who can't navigate the system. Tom Nichols, a 29-year-old Indiana National Guard veteran, has struggled to file his disability claim. After returning from Iraq in 2010, he became addicted to drugs and alcohol. Eventually, he landed in treatment for PTSD. Not only does Nichols not understand his benefits — he doesn't really know the best way to get them, either. He hasn't tried a VSO because he says it's too much trouble. "I've got to go to some VFW to track down this guy, and it's only the first Thursday of every month," Nichols says. So he filled out the paperwork himself. To some of the medical questions, he just wrote "ask my doctor," which could be part of the reason his claim didn't go through. Advocates say the VA rejects claims for reasons as simple as using an outdated version of the form. "It's basically on me to go out there and receive this," Nichols says. But a trained VSO can cut months and years off the time it takes veterans to receive benefits from the VA.
"You never want to apply for benefits on your own, unless you have some experience with it," says Bob Kelley, the VSO for Grant County, one of the Indiana counties receiving the most from the VA. The VA's own data show vets who give VSOs power of attorney receive more than double the disability benefits of vets who file their own claims. David McLenachen, acting deputy undersecretary for disability assistance for the VA, agrees that VSOs routinely help the system work. "It can be overwhelming for somebody to prepare a claim and submit it," he says. "The VSOs can be very successful at helping with the claim process." Kelley also goes to nursing homes and Veterans of Foreign Wars halls to tell veterans about their benefits, often on his own time. "It's not a career," Kelley says. "In the state of Indiana, it's not a career. When I retired from the military after 25 years, I was hired on at $28,000, and that's the average salary." But the state is trying to give VSOs more resources in order to ensure all veterans have access to them. Veterans Coming Home, made possible by the Corporation for Public Broadcasting, is a collection of resources and public media stories aimed at helping veterans returning back to civilian life. Looking for a veterans service officer? Visit the National Association of County Veterans Service Officers to find links to your state VSOs and state benefit resources. Or download a directory from the U.S. Department of Veterans Affairs. In the past year, the state paid for software and training so county VSOs could file claims electronically. And for the first time, the Indiana Department of Veterans Affairs set up workshops to explain federal benefits to vets. Bauerele is part of the Military Veterans Coalition of Indiana, which is pushing to reform the system in Indiana. He'd like to see better pay for county officers, and he wants the state to offer more help. 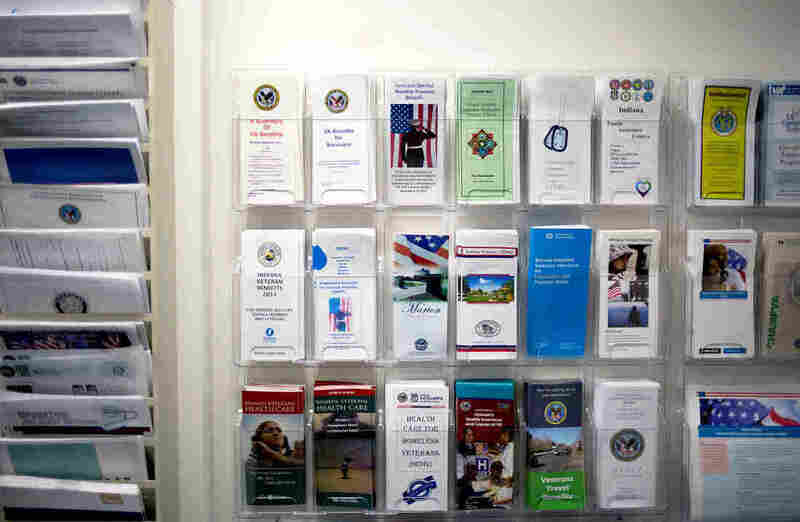 VSOs like the American Legion already process thousands of VA claims. "Every dollar you give a veteran is new money from outside the state coming into the state," Bauerele says. "That'll pay for a lot of Cadillacs, a lot of homes." A previous version of the Indiana map on this story transposed the cities of Elkhart and South Bend.